Make your way through a labyrinth tomb, completing puzzles as you go. Attempt to disarm a series of traps, rearrange objects to illuminate a dark tomb or unlock an ancient locking mechanism. For each game use LEFT (4), RIGHT (6), UP (2), DOWN (8) to navigate or select runes and FIRE (5) to perform an action. Press Left or right to spin the wheel and access the different game modes. Trial Mode presents the puzzles as an on-going story. The story evolves depending on which path you take. Legendry Mode allows you to play your favorite puzzles in any order you like. During Trial mode you can advance through the cut-scenes using the right hand soft key. All the puzzles are timed. The time is displayed as a row of dots that surround the puzzle. Once all the dots have disappeared, the time is up. Lara needs to get access to a room but an ancient locking mechanism is standing in her way. The Lock will open when Lara has filled the four liquid containers in each corner of the screen. To match the centre gem to a gem on the left, press left on the directional pad. Up matches to up, down, to down and right to right. If you need to match against one of the gems that is diagonal from the centre gem you can press the D-pad in the centre to spin the gems around. Once you have collected enough liquid the container will close up. The puzzle is complete once all the containers are closed. Lara must disarm the traps to continue. The traps mechanism is controlled by a grid of gems. 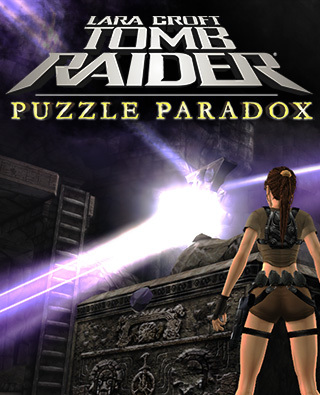 Lara must arrange the gems in a particular pattern to disarm the traps. Using Up, Down, Left and Right move the cursor around the grid so that it is over an empty square. Press the centre of the D-pad to place a gem on the grid. Repeatedly press the centre of the D-Pad again to change the color of the gem. The trap will disarm when you have filled the board with gems in a pattern that has one of each four colors in each row, column and 2x2 quadrant.